Wouldn't the tensioners on the seatbelt still work when you remove the airbag? Hi Ido. How it has been explained to me by the cert guy. Any steering wheel airbag removal requires a new seatbelt to be fitted regardless of condition. Apparently the regs. 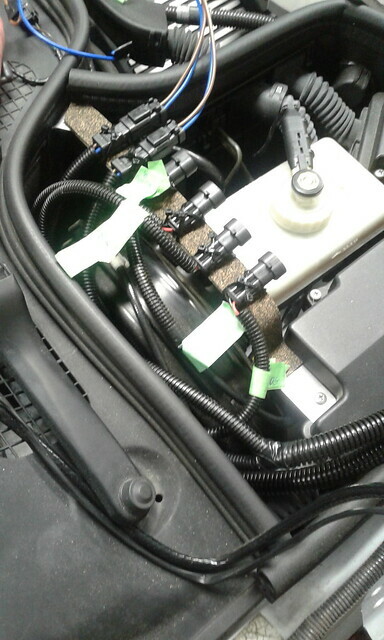 The pre tensioner will still be under the seat but disconnected from the system and not attached the the new seatbelt clasp/latch. As I am leaving the passenger airbag in it looks likely that side escapes the rules for a replacement seatbelt and will work as normal for the srs system. 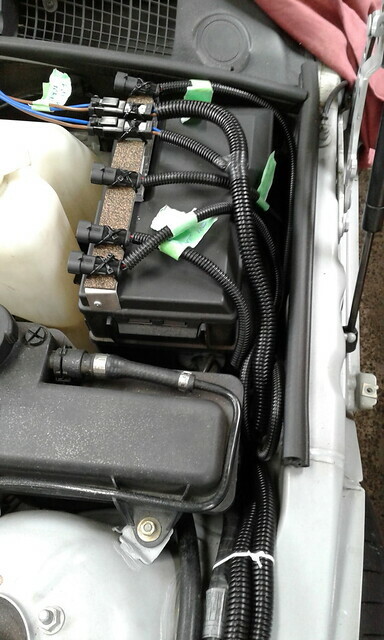 Ballast resistor required for airbag removed. Hope this helps fella, cheers. Hi guys, not good news on my front so remain patient for updates. Apart from a car tinkerer I am also a goalkeeper coach for kids football. Unfortunately blew my left knee MC ligament yesterday at coaching and laid up in pain with the legs horizontal. No options on the car other than the wait it out! So this weekend ain’t going to plan! Perhaps you can spend your recovering time researching finishing touches on line? I know buying new stuff often cheered me up during my own build. Hey thanks Paul. Starting touches may be more appropriate than finishing, but I certainly know what you mean. I will spend sometime hopefully wisely that will benefit later on! I am not a passive relaxer, so with the wait for the kit and now this it is testing my ying and yang! Cheers fella, appreciate the thoughts. Any improvements in the knee, or the roll cage, or both? Hi Barber, thanks for the catchup! Still chugging along with the knee, seeing the specialist on Monday, but am certainly moving around better than I was a few weeks ago. 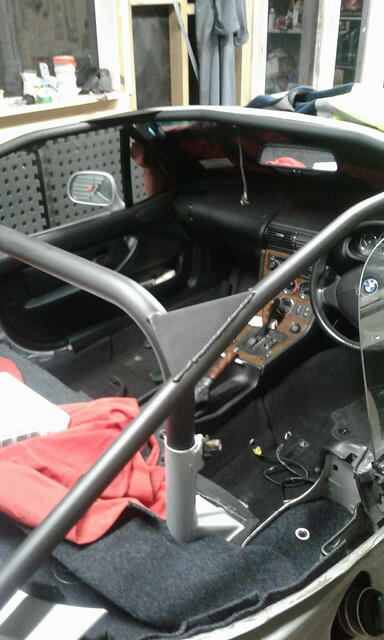 Roll cage now fits the car, still tight going in but that is due to a slight “crab” in the roll tubes that evidently occurred when fabricating. I have the certifier coming round tomorrow for more photos of it installed and fitment locations so that they can be sent for final structure approval. If all ok I will be cleared to paint/final install and carry on! I could have soldiered on in other areas, but with the disappointment of not being able to get started as I wanted, plus the knee issue it dropped my enthusiasm for a bit. Now getting around more I am happier, just need the ok with the cage etc and I can progress onwards a bit better! Liking the progress with the roof/glass on yours, should be a fine finish on that one!. Cheers. Contrary to potential beliefs I am still alive! Been watching your progress on your threads avidly in the background with very little to say so have stayed silent! Honestly my build has been a frustration coupled with personal and family illnesses so I have stayed well away from working on the car when not in the best frame of mind. Very mindful not to do something twice so better not at all. The good news is there is sun breaking through the horizon. I have finally got the go ahead and the green light from the certification side over here to proceed. So just having a catch up/set the plan with the certifier on Monday and then I am all go. Unsure what my schedule will allow me to put in time wise, but will make sure it is as plenty as I can make it! 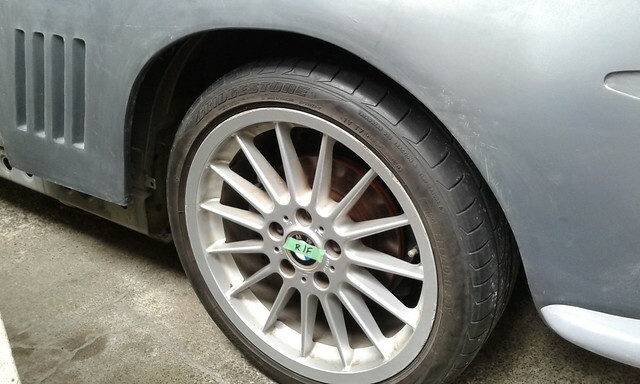 The only progress has been the parcel shelf/new speakers set up in the car and partial wiring extensions started as well as the front alloy bumper resized. Minimal work due the delay but I had weeks where I couldn’t move freely so just left it. Hoping the roof support/cage will be prepped and sprayed next week for fitment soon after. Once in I can get stuck in all over the build but am going to concentrate on front clam and inside shelf area prior to re-fitting the seats etc. Hoping for some photos soon to give me some enthusiasm of progress and to get my A into G! Been some progress but some challenges as well. Wiring: Have virtually finished extending the lighting back to the rear engine bay scuttle ready for wiring through the front clam. Pretty standard stuff, soldered wires, heat shrink and waterproof quick disconnects for the transition to bay/clam so if I need to remove it in future much easier proposition. Going to work on a couple of brackets for the disconnects to tie to as well as tidy the looms etc. All the left side tested out ok so fingers crossed for the rest of it! SRS: this will be the challenge. Due to having to meet 700mm zonal head impact regs, as the cage is close and well within standard 900mm, then webgrabber seatbelts needed both sides. They are being discussed next week with supplier. Thought I had it nailed with resistances reqd to bypass pretensioner and seat belt buckle, but something wrong. Used 3.3ohm for squib and 100ohm for “buckled” bypass but SRS fault light stays on. Unfortunately OBD2 that I am using tells me no fault codes so I can’t reset anything! Another days problems I think!.....It may be picking up the passenger seat pad fail as it is not plugged in so I may end up with the original guts of the seat plugged in and tied under the seat assy somehow to get round it and just bypass resistor the airbags both sides. We’ll see. Cage: Painted and ready to go in. Anti crush tubes were required by LVV to be fitted at front location bolts, tube wall is probably fine but didn’t take me long to fabricate/paint some fill in tubes. Hopefully put in tomorrow so I can start working on high level brake light fitment to roll tube. Parcel shelf area about 90% there, some carpet needs trimming etc but letting it settle into the curves before I do that. 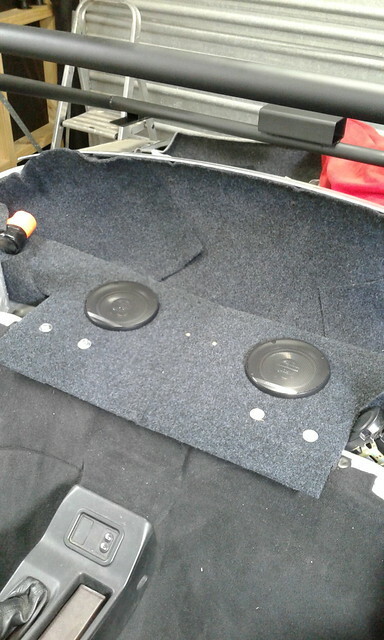 Bloody new speakers don’t work after wiring in, unfortunately didn’t check the originals worked before I took them out so it may be an input issue from the head unit plugs etc. Nothing visible but another challenge to work through before the seats go back in. So hopefully getting closer to some pictures tomorrow and pulling the front clam out of the crate for a play! Cheers. Well done matey, looking forward to the pics. I'm presuming yours is a facelift car. There is an issue with not being able to read fault codes from the round plug under the bonnet. 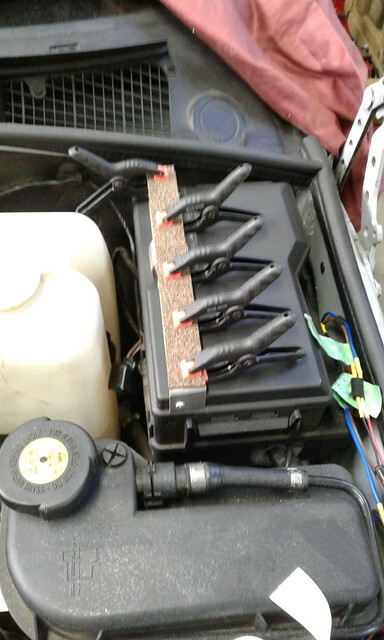 I can read from the plug under the steering wheel but nothing from the plug under the bonnet. This link should help you solve it.........hopefully. I haven't tried anything yet because my electrical knowledge stops at putting a fuse in a plug. Thanks for the link Jag, I’ll have a read but it might be past me as well! 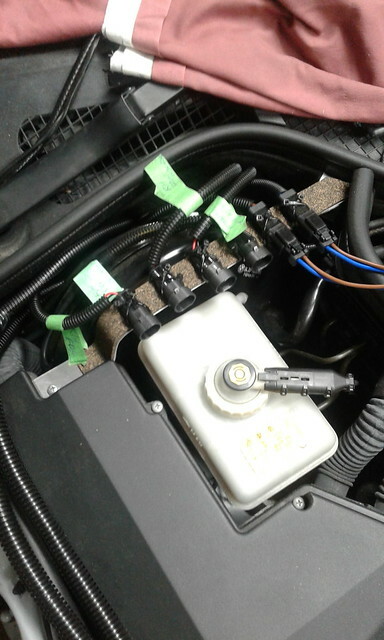 I am plugged into the under the steering wheel location, scanner says it is connected, shows revs etc when engine running and says connected to ecu, but draws a blank when asked for codes, just says none stored in ecu. Once I plug everything back in it will be interesting to see if it self resets. I thought I might get some snags like this once I start looking at bypassing pretensioners, seat belt buckling as well as passenger seat occupancy pad. 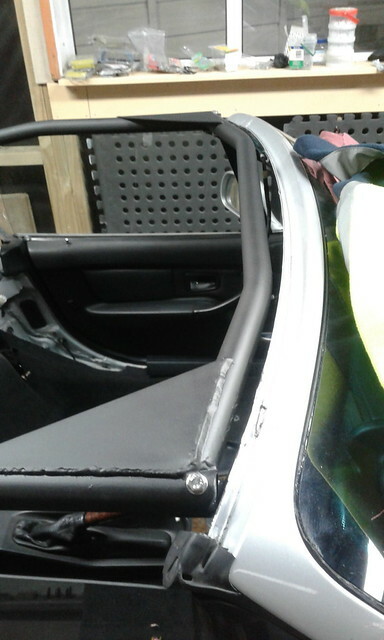 Possible backstop will be remove seat belts from car and reattach the clever bits under the seat with the belt tangs coupled which should stop the gizmos being unhappy. 3.3ohm resistors should then take care of the steering wheel and passenger airbag circuits. Good morning on my facelift car it was the opposite more codes could be seen and reset by using the under body unit rather than the under dash one , thanks geoff . Hey thanks for the imputs guys. It seems upon further research and the info supplied by casamolino/Geoff it looks likely I need the 20 pin scan tool for the SRS/airbag system. 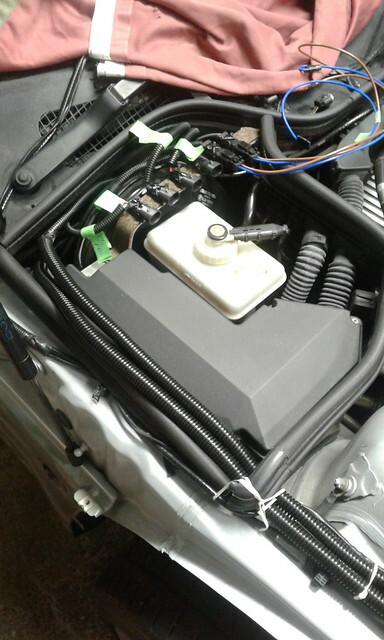 It is I believe the under bonnet plug that links to the ABS and air bags. Agree Jag - Sourcing the 20 pin diag tool and see how we go. not as much progress today as I would have liked, wiring is taking a bit longer than I thought and when you drop one of the Deutsch pins down underneath the ECU when doing the R/H side and cant find it that has an effect! (made out of thin gauge ally and riveted on - rubberised cork soft surface on top for fretting and fuse box lid still can be removed with harness slack. Nice to be underway and with a bit of energy into the project. I'll start on the front clam soon and still need to talk to Chris/Dan about some req'd bits. Well managed to squeeze a few hrs in after work and managed to get the R/H electrical looms in and bracketed. 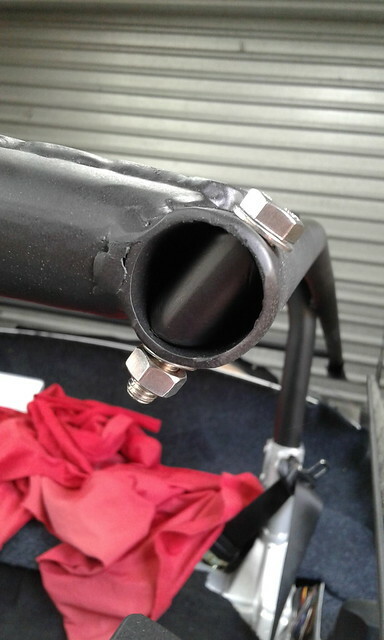 Same as the L/H side used ally fabricated into a bracket and fixed to two screw locations on the bulkhead as well as using one of the captive screws on the "E Box" on the R/H side by the brake master cylinder. Nice and tidy and hopefully out of the way of the clam when I get to put that on. Just a bit of final clipping and permanent labelling left to do. Roll cage is finally installed and ain't coming out again! Need to tidy around the tubes, fix with custom sized bolts at the rear end and @ chassis tubes to tidy up the locking/finish. Great, well done, you just have to keep going now. Cheers Barber, will do my best! For any kiwi based followers, have worked thru the LVV side of things as far as the seatbelts. 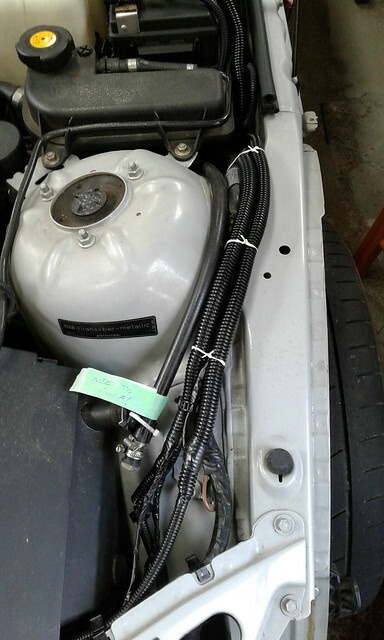 New belts required but as the BMW belts are spec’d at approx 75 degrees and 105 degrees then webgrabbers can’t be fitted as they don’t make them to that spec. So normal new inertial reel belts and stalks are being fitted as per allowed. This is due to the airbag coming out and the head impact zonal requirements with the coupe roof cage.. The LVV side is working out ok, a few little bits to consider or do differently from what is allowed/able to do in the UK, but nothing too scary. Just takes a bit more time and efforts that’s all. Last edited by Welshkiwi; 8th November 2018 at 07:41..
Hey guys, a bit of progress today, but i keep getting caught out in the timescale of doing things! Mind you I spend too much time admiring and planning than doing actual stuff at times, I'll learn! The front end is on and generally all good. 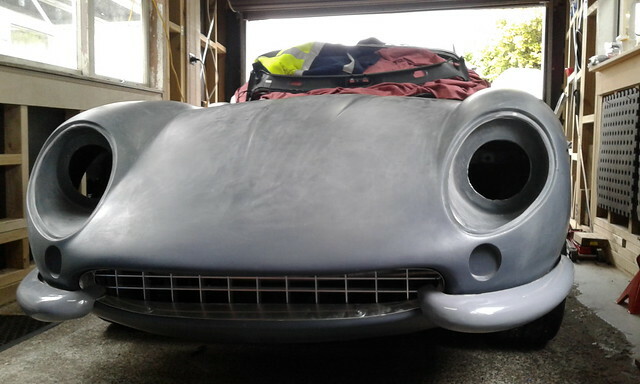 I am going to have to play a bit as I have a height difference between left and right hand sides/wheel arches etc but once I get the bonnet catches sorted we'll see what I have. Hoping not a major to align all that up. You may see below a bit more gap on the L/H side at present. Approx 30mm. I have already got the bonnet stuck about three times so far and at present definitely a two person job to release and raise. 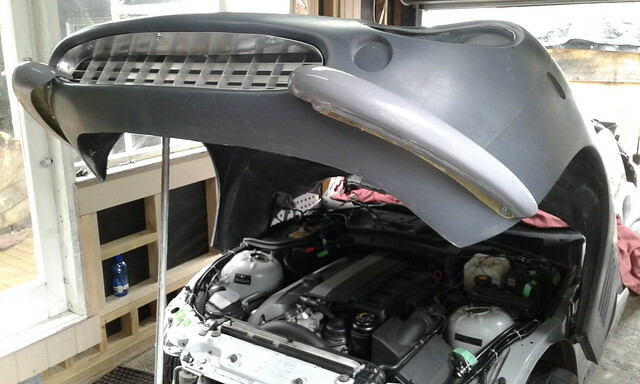 Bonnet lines out of the mould are pretty good. 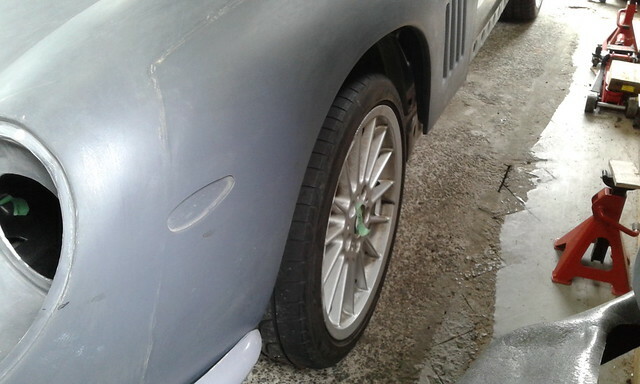 Some small work needed on the left side as there is a small "wave" in the line coming down the bonnet/over the wheel arch, nothing too major just final fettling stuff before paint etc. Side Indicators will need to be stripped and rebuilt with longer retention bolts - Too short to go through the clam fibreglass suitably. Bumper trimming needs to be done a bit but plenty of work to do before then. - They look real good though with the front end shape. Sorted the SRS system, just need to make a Passenger occupancy sensor bypass tomorrow (2x100 Ohm resistors and a 1N4001 or subsitute diode) once is put in and reset I should be clear of the pre-tensioners and buckles/occupancy. Just need to ballast the airbags at a later date. Last edited by Welshkiwi; 11th November 2018 at 04:22..
All times are GMT +0. The time now is 06:28.